The Aardenburg Archives are all about modern digitally mastered prints and photographs. Today these prints are not fully appreciated by museums or by collectors precisely because they are so modern. In the not too distant future the materials and processing technology that went into their creation will be become obsolete and no longer possible to recreate. The goal of Aardenburg Imaging’s Archiving program is to curate a growing collection of modern media, carefully documented for artist, image, and especially the materials and processes used in the creation of the work. History is, if you will, always in the making before it’s truly considered by the general public to in fact be history. The Aardenburg Archives is striving to become a modern photo printing materials and process archive, where donated prints from our members are always welcome and where Aardenburg staff is actively creating prints on modern printers, inks, and media in order to preserve accurately identified and cataloged digital print media from our modern era of photography and printmaking. The pace of change in the digital imaging era is frantic, and we can easily forget that advanced imaging and printing technologies of only ten or twenty years ago are now relegated to the arcane history of photography. 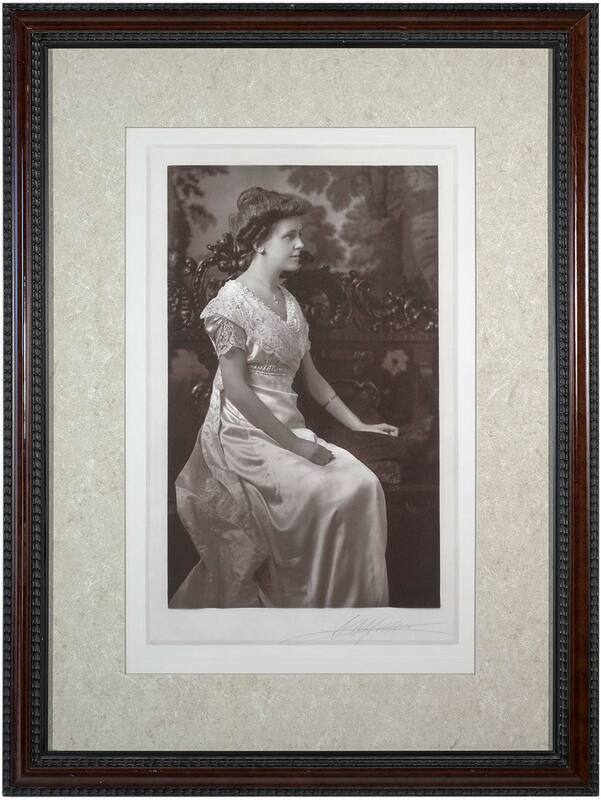 For example, the image shown here is of a matted and framed IRIS 3047 print, itself a reproduction of a digitally restored silver gelatin print originally made in the 1920s. Very few IRIS printers are still in operation today. The original image was a water damaged silver gelatin print of my grandfather’s first wife, Elsa. She died at a young age from influenza. I’m a descendant of my grandfather’s second wife, Lorone. My mother’s half-sister was my dear Aunt Gretchen, whom I adored (she was joyful, witty, and totally eccentric… perfect humanitarian qualities in my view). Aunt Gretchen asked me if I could fix the damaged original print that meant so much to her. I scanned the damaged print on a Heidelberg Topaz II flatbed scanner in 1997 and digitally corrected the watermark stains and emulsion losses using an Apple Macintosh software application called “Live Picture” (just one of many now-orphaned pieces of code in the digital imaging era). I then made the print shown here on an IRIS 3047 printer at a company, Old Town Editions in Alexandria, Virginia, that I cofounded, with my friend, Chris Foley, in the mid 1990s. The Iris 3047 printer single-handedly ushered in the entire market of “digital fine art printing”. It could produce astonishing gravure-like prints of extremely high photographic quality that even to this day have a cult following of admirers. Yet the IRIS 3047 printer was an irascibly cantankerous machine with very poor print yields, and so, its continuous flow inkjet printing technology was an easy mark to be superseded by the newer and more reliable “drop on demand” ink jet printers that soon followed. This print has now become highly collectable, not so much for its subject matter, but due to its materials and process provenance. It eloquently speaks to the reason Aardenburg Archives is now carefully collecting and cataloging modern digital print media.